The narrative is delivered in an unconventional manner, with the end of the trick revealed at the very beginning of the film. We witness the haunting final moments of a man's life and the aftermath as the supposedly guilty party is charged with the crime, but what could have possibly lead to such a horrific conclusion? How could a magician be capable of taking the life of another in such a cold and calculated way? The old adage is that a magician never reveals his secrets, and yet Christopher Nolan succeeds by doing just the opposite in The Prestige. By methodically pulling back the curtain on the mystery presented, by directly asking the audience to pay close attention and rewarding those who do with a compelling story about a professional and yet also deeply personal rivalry that began as a search for answers and revenge, Nolan crafted an original and fascinating winner. Not surprisingly this is a gorgeous film to look at, with the usual dazzling cinematography that comes with the worlds Nolan creates thanks to his director of photography Wally Pfister. The candlelit shadowy rooms that utilize lighting in ways that make the characters naturally glow. The way a field shrouded in fog looks when illuminated by a sea of light bulbs powered by seemingly nothing. It's actually sort of baffling, how a cast of recognizable Hollywood stars filmed with such a slick, modern aesthetic can still feel authentic for the era being presented, and that is due to the production design, the costumes, and the artistic integrity that brilliantly fill every single frame throughout. What a cast across the board, with Hugh Jackman and Christian Bale bringing honesty and raw passion to their roles as the competing magicians. Michael Caine has developed quite the working relationship with Nolan and yet it is entirely possible this is the best collaboration to date in terms of his performance. Scarlett Johansson may not deliver the most convincing English accent but her look and mannerisms are spot on for a role as a magician's assistant, the perfect misdirection for an audience to miss the sleight of hand and thus believe in magic. 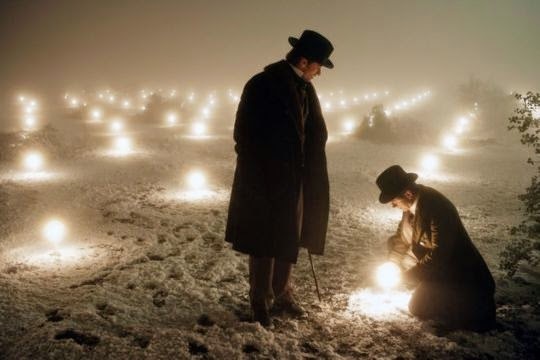 The Prestige feels as if it is powered by Tesla's machine, as even though it is wonderfully focused on both telling an interesting story and also truly developing characters and relationships, it manages to pick up steam as it goes, glowing brighter and brighter the closer we get to finally learning the truth behind what we saw at the start. Even as I have seen it a few times prior to this viewing and knew exactly how it would play out, this is a movie that is mesmerizing to watch unfold again and again. Of course. How could I not?